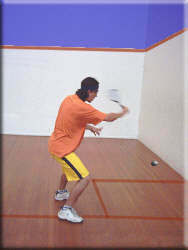 The squash drop shot is an advanced skill which requires finesse, including wrist and racket face control and balance. The speed of the swing and hitting angle are crucial to success. Approach the ball facing the side wall, shoulders parallel to the side wall. Allow the racket swing to "slice" under the ball. The drop shot is very similar in technique to a drive, but with some important differences. It sometimes has a shorter backswing as power does not need to be generated. Ensure that the racket face remains open. Push the racket through the ball to create the slice. The player should get down to the ball to keep the racket face no lower than the racket handle. Little or no rotation of the forearm. The racket head speed is usually much slower than the drive. - as racket head speed increases, racket face must be opened more. The follow through is much shorter depending on the position from where it is played. The harder the drop shot is hit the more slice(backspin)required. Backspin is a very effective "tool" in squash. It is truly a "thrill of skill" to be able to successfully and consistently execute a drop shot not only from the front of the court, but also from mid court. There is a great amount of "feel" to playing a drop shot' a sensation that travels from the fingers/hand/racket right to the brain, sometimes referred to as a finesse shot. It will take many hours of chipping along the front wall, firstly stationary, then travelling, and at the same time slicing, cutting, underspinning, lifting, to accomplish this special sensation. Stay Low (usually by lunging forward). Keep the ball tight to the side wall. If the ball is out of the corner, say half a metre, angle the drop shot to land in the side wall nick. 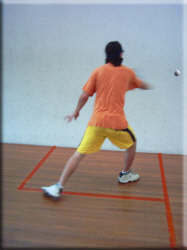 The drop shot from the front of the court is usually a softer shot. Get to the level of the ball (usually low). If the ball is below the level of the tin, the hit must result in an upward trajectory. Prepare to recover off the ball quickly as a stroke may result. give the impression of playing another shot, ie drive or boast. get up to the ball quickly, plant the foot firmly, good backswing (at this point it looks like a hard shot, and slice the ball to underspin the speed and length. To deceive your opponent there has to be time (a delay). This always works better when the opponent does not watch the ball. Approach the ball side on. Because of the distance the ball has to travel be certain to swing through. Swing through and under the ball. The slicing action with lift the ball upwards to keep the ball above the tin. A drop from the mid court (or deeper) can be an effective shot but can also be prone to errors. Keep an almost full backswing. Keep the racket face a little more open and increase racket head speed compared to a front court drop (as the ball has to be carried a further distance to reach the front wall). Keep forearm rotation to a minimum but follow through in the direction of the shot. Take the ball out in front. Hold the racket firm. 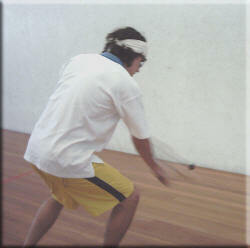 A slicing action (open racket face), with the swing going downwards, will backspin the ball. The angle the ball is struck will determine the angle the ball rebounds off the front wall. Usually played off a hard shot and played with a short punching action. Angle the shot into the nick. Take the ball out in front. In General keep a firm wrist to maintain control. Keep a very open racket face. The Forehand Drop Volley is a combination of a volley and a drop shot. Undercut the ball to take the pace off the shot. Angle the ball into the side wall nick. Drop volleys - firm wrist of not ?